In my days at TheNews and TEMPO Magazines, there ensued a debate about what kind of journalism we should be practicing. Though, this debate was an issue of interest across the different stables in and of the profession at that time, it was essentially of special interest at the Independent Communications Limited, the Publishers of TheNews and TEMPO magazines, the PMNews and the AMNews because of the professional trajectories of some of the founders of the stable. What drove this debate in the stable of Independent Communications Limited at that time had everything to do with the trajectory of the then firebrand founders who had a face-off with General Ibrahim Babangida, who was then the Military President of Nigeria and a face-down with Chief M.K.O. Abiola, who had hitherto been an employer of some of the dramatis personae of this debate. The dramatis personae in the debate included the indefatigable Bayo Onanuga, the seminally brilliant Babafemi Ojudu, the precociously deep literary virtuoso Kunle Ajibade, the always scintillating and dazzling Dapo Olorunyomi, erudite Ebenezer Obadare, fantastically savvy and lettered Laolu Akande, the taciturn but courageous Seye Kehinde, the quiet but intellectually sizzling Simon Kolawole and a host of other top flight journalists whose names I could not immediately recall now. This by no means, was a one day conversation. Often times, it was an improptu one brought about by a news event. Or it could be as a result of a response by a news maker. It could be initiated by the nature of a report on an incident or event. It could also be caused by the efforts to isolate the official "response" or handling of particular news material by the stable. Any or all of the above situations could have been the causal variable for the initialization of the conversation. There were several Schools of Thought about journalism typologies that emerged, in my own opinion, from the conversations. But I have limited them to four definable genres for purposes of this conversation. There were (a) Conventional Journalism; (b) the Interpretative Journalism; (c) Advocacy Journalism and (d) Crusading Journalism. The first typology was the Conventional Journalism. It was defined as raw, organic and very natural journalism, not necessarily unrefined or unprocessed, but obviously uncomplicated in nature. The protagonists had characterized it “straight journalism.” It would be a kind of journalism that would just report events as they were without any attempt at any analytical imputations for the readers to behold. It would be the rough – hewn, unstained and untainted traditional journalism that seeks only to just “inform, educate and entertain” and nothing more. This school of thought felt that the readers were never stupid and their rights to their own conclusions ought not be invaded by interpreting anything to and for them. The protagonists insisted that it would be gratuitous for anyone to assume that the readers are unable to discern, decipher, discriminate, distinguish, differentiate and determine their own conclusions in the midst of the plethora of information with which they are daily assailed. It was the conclusion of this School that the readers would be able to figure out what they should react to and how to do so through their own judgements. But there was another school of thought that pushed “Advocacy Journalism.” This school of thought noted that there was nothing wrong if a particular bent, that was ideologically economic, political, social, religious or any other was adopted, preached and sold to the readers. There would be active espousal of the adopted position. There would be pleading for, supporting and recommending such an adopted view or perspective. In many ways, there would be an active propagation, promulgation, justification, defence and promotion of the adopted ideology. The protagonists expressed the belief that, though this might be seen as a narrow prism, but it was not “unjournalistic” to perform such a responsibility in other to set an agenda for the polity, something they claimed was part of the roles of journalism. Still, there was another school of thought that advertised the concept of “Crusading Journalism.” This one has a wider prism than the Advocacy Journalism. It would not be fixated on any single subject or ideology. But it would lead the struggle for any objective cause that would benefit the weak, the vulnerable, the oppressed, the disadvantaged and the deprived. It would not just report on such matters, according to the protagonists, but it would repeatedly be part and parcel of the efforts to turn things around through laser focus reportage, constantly and consistently, until the objective of change in relation to that issue or subject, has been achieved. The “crusaders” would be choosing, from time to time, the particular battle to be fought and the subject-matter of the crusade. Yet, there was another school of thought that believed that Interpretative Journalism would be the best. The protagonists of this concept felt that Journalism needed to be taken a step further, without necessarily impugning its traditional functions. This school of thought believed that the task of “education” as one of the primary pillars of journalism had to be fully taken on, expanded and pushed forward in order to advance the good of the polity in general. Its protagonists contended that the reader’s right to make his or her own conclusions would still have remained inviolate but with an added advantage of perspectives that might not have occurred to such a reader if he or she were to be left alone with his or her own intellectual compass. It was posited that the traditional roles of Journalism would have been further enhanced and the progress of the polity further propelled while the knowledge and perspectives of the readers are much more deepened and their horizon extended without their rights being abridged. Then, there is the Kayode Murtala Principle of Journalism. The Late Alhaji Kayode Murtala was my News Editor in my days at the Sketch stable in Ibadan in the late 1980s. He was the one who availed me of the concept of journalists as Historians in a hurry. He was never tired of reminding us that Journalists have great responsibilities to the society. He underscored that the implications of their work was not just for the present but, most importantly, for the future. He repeatedly hammered that concept into our consciousness. 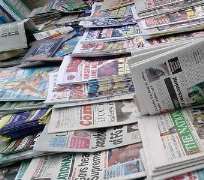 In his extrapolation, Alhaji Murtala noted that for this reason, journalists must always ensure that their reporting have integrity as regard to factual contents. He posited that someone in the remote or immediate future might need to make references to an event and had to fall back on the report of such event by a reporter. If the report had misleading factual contents, the implication would be dire not just for the researcher but for the polity it seeks to benefit with the work of such research. He often noted that despite the pressure of and for deadlines to be met for the production of the newspaper, we still had to get it right because we were writing History. Yes, he admitted, we were in hurry and we had to be in hurry to meet production deadlines, but he insisted that we should never forget that we were historians; historians in a hurry. Getting the contents of our reports right was, imperatively of a high premium priority. Personally, I am biased in favour of Interpretative Journalism. My reasons are very straight forward. First, I am of the view that its operational expectations remain within the ambit of the traditional journalism. Seeking to engage intellect and deploying such to advance the value and volume of information could do no harm to the profession and its practices. Two, I believe that the levels of our literacy, not just among journalists, but also among the reading public are very different. At times, the differences could be very minimal, as tiny as a pin-hole, and it could be as wide as a gulf in some cases. The same thing would go for our levels of education which must not be confused with the levels of literacy. An interpretation by a well informed mind would raise the ante of analytical tools for the readers as well as other professional colleagues and enrich everyone’s perspectives. I also believe that our studies at the Universities, in terms of the courses taken by each and every one of us are variables that come into play in the way and manner we all view events, understand them and interpret them. A journalist with a background in Law would have a different perspective from one with background in History and Political Science or with the one who did straight Mass Communications or the one who only studied just English or Yoruba or French or any Language for that matter. These, by all means, are not meant to be mutually exclusive to the basic fundamentals of the practices of the profession of journalism. All the fundamentals are expected to be taken cognizant of and be duly considered and observed in the course of the performances of and on the job. To this extent, we could all rub on each other either as journalists on journalists or as journalists on readers. Knowledge is very deep and wide. And at times, it could exert itself from uncommon or unexpected sources. We all could benefit from each other. Interpretative journalism has more benefits for the polity as it were, than other genres, all things considered. With the coming of the information age and the phenomenon of social media, a lot of the sifting and gate - keeping deployed to observe some of the rules that have hitherto ensured the dignity of the profession and its integrity have been subjected to evasion and erosion. With the increasing growth of Fake News genre, its impact on the historical value of journalistic works has been unwittingly asterisked. It has obviously reached a crisis situation. Some have advocated the promulgation of new laws to stem the growth of Fake News. How this would be accomplished within the confines of other fundamental human rights remained to be seen. Hence, how this crisis would be managed in the immediate future is still open to question. But without a doubt, this is a crisis that is crying for adept management with a lot of questions begging for answers. It is in view of this that continued efforts had to be made to ensure the integrity of the contents of the news. This, in a way, would be an added positive to ensuring the integrity of the profession itself. Yes, journalists are Historians in a hurry. What they are leaving behind for those who would read such histories, have to be valuable and up to the standard in terms of integrity and the dignity of the profession.